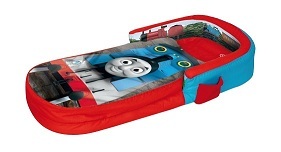 Featuring everyone’s favorite train, The Thomas and Friends Ready Bed from Diggin is the ultimate sleepover solution. Perfect for when little friends come to stay or for nights away, this clever product makes staying over simple and lots of fun. It’s great for moms as there’s no fussing over spare beds and bedding since the Ready Bed is an all-in-one solution including pillow, mattress and duvet. This inflatable bed comes with an easy-to-use pump and inflates in minutes. Each bed has its own carry bag that makes transporting the bed easy. Perfect for nights at home and trips away, the Ready Bed can be used anywhere, anytime. Easily portable inflatable bed and bedding. Soft headboard for extra comfort and safety. Take Readybed on the road. Everyone loves Thomas and Friends. 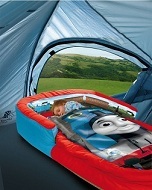 Now they can come along on your child’s sleepovers, inspiring sweet dreams with The Thomas and Friends Ready Bed. The Ready Bed has an inflatable inner with a soft cozy cover. With a soft integral headboard for extra comfort and safety, Ready Bed includes a fun Thomas and Friends story telling scene for little ones to share with their parents. A handy pocket keeps their favorite things safe while they sleep. The cover can be easily removed for washing. 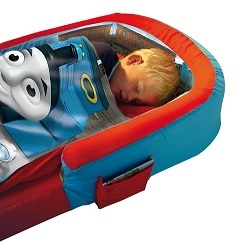 The Thomas and Friends Ready Bed is the complete package. This inflatable bed with it’s own pillow and duvet means no more searching for spare bedding. Whether it’s a sleepover, vacation, camping, or a night at grandma’s, The Thomas and Friends Ready Bed is everything your child needs for a night away from home in one bag.